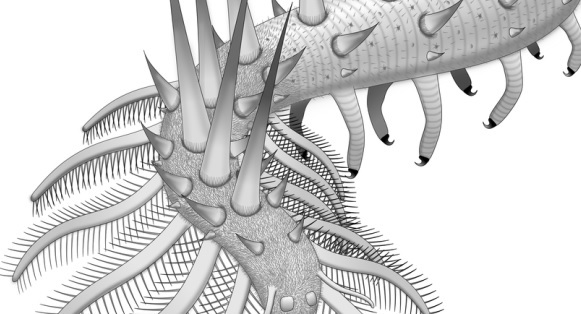 The fossils of a weird-looking, spiky sea creature that lived 500 million years ago during the Cambrian Period has been found in the Yunnan Province of China. Scientists say the wormy creature had 30 legs, with those at the front looking like feathery filters which it used to strain the seas for its food. Considering the fossil, scientists believe the creature had armor which it used to protect is under-belly, and it had 72 spikes running along its back. Javier Ortega-Hernández, one of lead researchers of the study and a research fellow in paleobiology at the University of Cambridge, noted that the Collinsium was very big for a worm even though this shouldn’t be too surprising given the fact that the Cambrian period saw many strange animals. Ortega-Hernández maintained that the specimen of the creature was about 10 cm or 4 inches which is big for a worm, underscoring the fact that the creature was the ancestor of modern velvet worms. It had a segmented body and a mouth that faced downwards, as well as a large bulbous head. Considering its fearsome features, Ortega-Hernández noted that the Collinsium was an odd-looking animal and many people would find it very shocking to come across one while diving or snorkeling today. The researchers that examined the fossil published their study in the journal Proceedings of the National Academy of Sciences. Android 5.0 Silver release date: February 2015 on LG Smartphone?